The Yamaha CLP645WA offers the player a powerful sound combined with a superb wooden keyboard. Play along with rhythms to enjoy a new form of piano performance. The Yamaha CLP645WA is a new model introduced to the Clavinova range of digital pianos. The CLP645WA features the acclaimed NWX Natural Wood keyboard with escapement and synethic ebony and ivory keytops, wireless bluetooth audio connectivity and upgraded 60w amplification/speaker system to give a fuller bodied sound at lower volume levels. The CLP645WA has twice the number of speakers found in the lower range models and this gives a clearer, richer and more defined sound. The new CLP645 is available in a choice of satin wood colours including Black Walnut, Dark Walnut, Rosewood, Satin White and White Ash. We offer a completely Free Nationwide delivery service on the Yamaha CLP645 digital piano. This service is fulfilled by a courier (usually TNT) and the instrument will arrive boxed at your doorstep or gateway and will require some minor assembly. Please note, a courier will not deliver the piano up any stairs. Building a digital piano is generally very easy and only requires a screwdriver. All digital pianos have assembly instructions printed either in the manual or on the box itself. 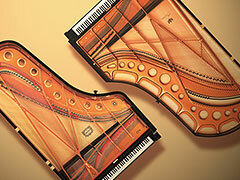 Depending on the model a digital piano can usually be assembled within 15-45 minutes. Take care when placing the main unit on the stand. We advise 2 people to lift the main unit out of the box and place onto the stand to avoid damaging the unit as they can be quite heavy. The new Yamaha CLP600 series now include full piano samples of the Yamaha CFX and Bösendorfer Imperial concert grand pianos. This is a huge step forward for Yamaha and their digital piano technology. Never before have they included a fully sample concert grand piano and now they have two! From the full, rich, bright tones of the CFX to the subtle, softer tone of the Imperial grand you have true diversity in this new range of Clavinovas. The CLP645 features a natural wood keyboard - a true wooden key just like an acoustic piano. Just like acoustic pianos, the materials used for the CLP645 keys are cut from wood that has been carefully selected and dried specifically for use in making musical instruments. Click the button below to add the Yamaha CLP645WA White Ash Clavinova Digital Piano to your wish list.